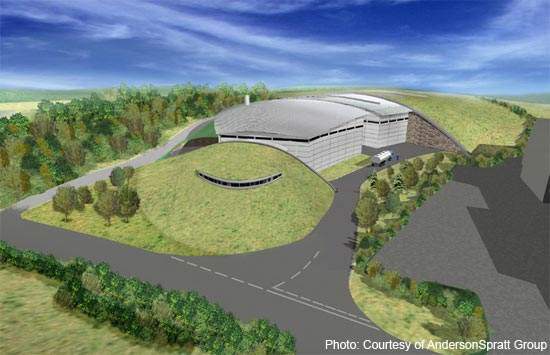 Computer generated view of the front of the new state-of-the-art North Down/Ards WWTP. Work underway on the North Down/Ards plant at Donaghadee. Computer generated view of the new second incinerator, constructed at the Duncrue Street site in Belfast. Aerial view of the work in progress at the new WWTP. Looking over Belfast. Rapid development has taken its toll on Northern Ireland's existing wastewater infrastructure. 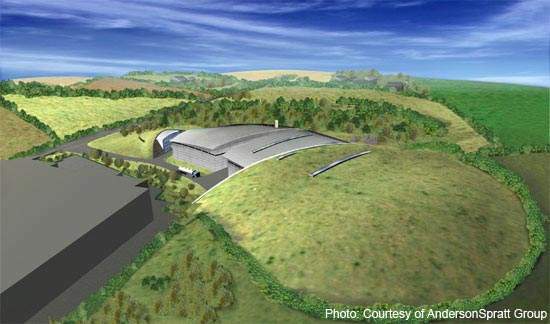 Computer generated view of the rear of the new North Down/Ards WWTP. Work in progress on the Briggs Rock pumping station. 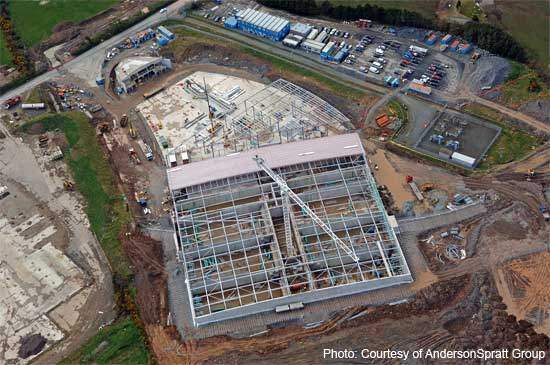 Construction underway at the North Down/Ards plant. 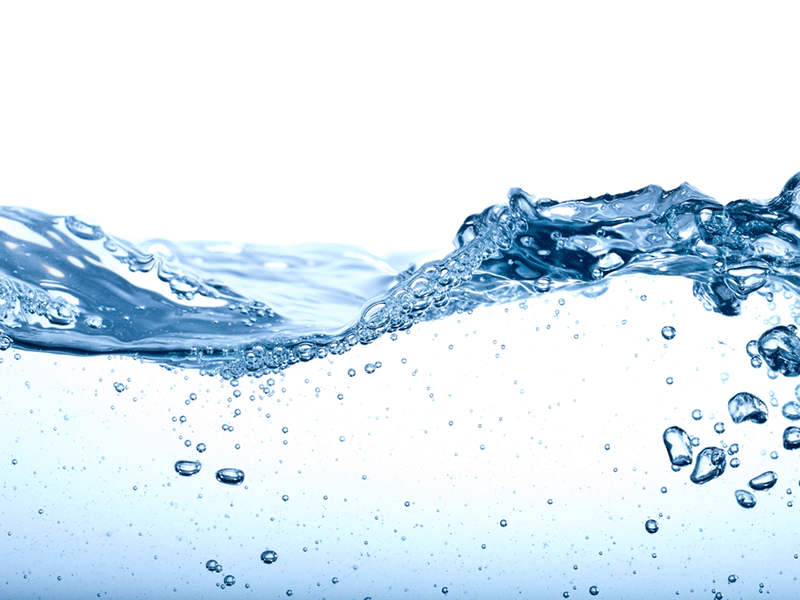 Project Omega is one of the UK’s largest Public Private Partnership (PPP) schemes and is expected to provide a fifth of Northern Ireland’s wastewater treatment capacity. It also handles the entirety of its sludge disposal. It was originally scheduled for final completion in late 2008, but was finished two years later, in 2010. 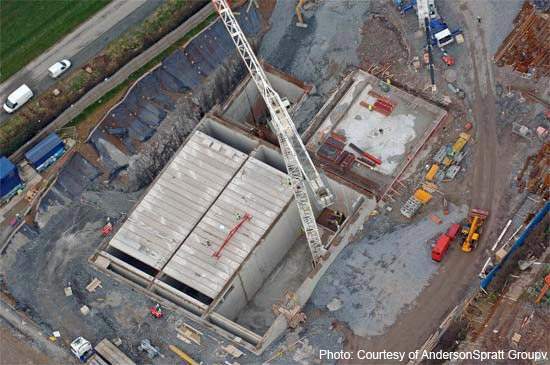 The project, principally comprised the construction of a new, state-of-the-art WWTP at Donaghadee and a second sludge incinerator – rated at 24,000t per year – in Belfast. The scheme is intended to form a sustainable wastewater strategy to meet the Province’s needs for the next 25 years. The project also included upgrading six existing wastewater plants – at Ballynacor, Bullays Hill, Seagoe, Armagh, Richhill and Ballyrickard – refurbishing a number of sludge facilities and constructing three pumping stations and associated transfer pipelines. 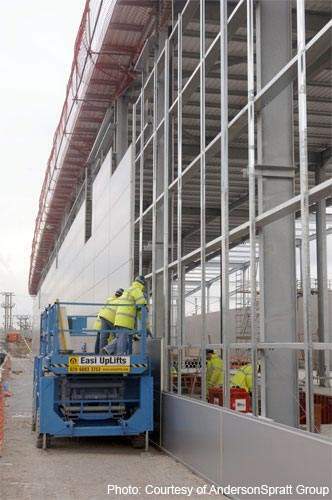 The project cost was £122m – strong competition throughout the tendering process and the high degree of innovation encouraged by the PPP performance criteria having yielded savings of more than 17% of the original £154m capital estimate. The scheme is intended to form a sustainable wastewater strategy to meet the Province’s needs for the next 25 years. Northern Ireland’s rapid development has taken its toll on the existing wastewater infrastructure and although there has been significant progress in improving discharge standards, pollution along large stretches of the coast and rivers has increased. In 2003, Friends of the Earth complained about the ‘inadequate, over-loaded and non-existent sewerage provision’ to the European Commission – setting in motion a series of events which ultimately saw the European Court of Justice ruling against the province in February 2007. To address these problems, a major investment programme was put in place intended to improve the provision of wastewater treatment and sludge disposal to protect the local environment and meet the strict demands of the Urban Wastewater Treatment Directive. 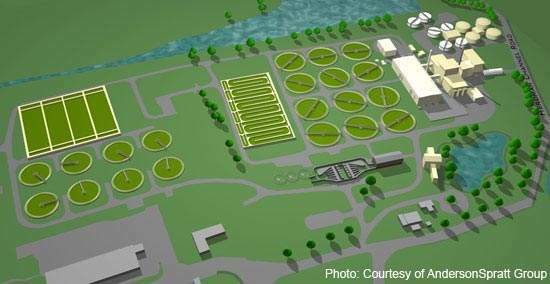 Project Omega arose out of this need to develop a comprehensive regional approach to wastewater and sludge disposal. Overseen by the Water Service Northern Ireland – which became NI Water Ltd – the contract to design, build, finance and operate the new treatment plant and incinerator was awarded to Glen Water, a joint venture between Thames Water and Laing O’Rourke. Selecting a robust and secure solution for all of the province’s sludge inevitably presented a major challenge. After due critical evaluation of a range of different options, incineration finally emerged as the most appropriate, since it offered a sustainable, long-term approach with minimal environmental impact. 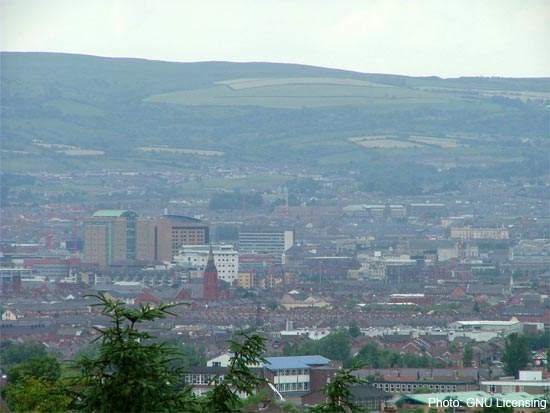 A second incinerator constructed with an annual rated capacity of 24,000t will both significantly improve the existing incineration facility in Belfast, while doubling Northern Ireland’s total sludge processing capacity. Sludge is treated in a purpose-built fluidised bed incinerator, operating at a temperature of between 850 – 950°C and working at between 70 – 100% of its effective rated capacity. The two incinerators enjoy a symbiotic relationship, the output of the new incinerator being influenced by the volume of steam produced by the existing facility. The new incinerator is designed to produce the maximum amount of power through its associated new turbine – the 45 bar / 420°C superheated steam produced by the forced circulation boiler being used to generate electricity. In essence, the more steam the current incinerator is able to send to the new one, the greater the power production. Incoming dewatered sludge cake is initially stored within a purpose built automated bunker holding a maximum capacity of 1400m³, equipped with a sophisticated ventilation system, with built-in methane and hydrogen sulphide sensors to prevent a build-up of gas. In operation, air is drawn out of the bunker to be used in the combustion process, while two additional vent fans ensure that necessary levels of ventilation are maintained during essential maintenance or in the event of the incinerator being stopped in an emergency. The more steam the current incinerator is able to send to the new one, the greater the power production. The sludge cake is then fed into the incineration process from a hopper, with a coarse separator being used to remove stones and other unwanted solids, before the sludge is finally fed into a thin film dryer. Dried sludge then travels along screw conveyors to the fluidised bed incinerator. The new incinerator is designed around a four second flue gas reaction time to ensure the complete oxidation of organic material, its core temperature being controlled by a series of operational parameters to ensure maximum efficiency. Incidental variations in the water content and thermal value is equalised by controlling the incineration air temperature between 150 –250°C, while longer-term fluctuations are controlled by the evaporation capacity of the dryer. Electrostatic precipitators are used to separate the majority of the fly ash from the flue gas with the pre-cooled flue gas entering the scrubber system. The first scrubber – operating at a pH of less than three – provides a quench system and cools the flue gas down to saturation temperature. The second scrubber is a two-stage packed column to give sulphur dioxide removal and operates at pH seven, controlled by caustic soda dosing. Direct contact with cooled water during the second stage cools the flue gas down to around 50°C. To avoid an unsightly plume visible at the stack, provision is made to mix additional hot air at 120°C with the flue gas – the air from the bunker ventilation is heated up via a low pressure exchanger to be used as mixing air in the process. Work on the Donaghadee WWTP, a new-state-of-the-art treatment plant intended to rival the best in Europe and to serve the North Down/Ards area, has been completed. 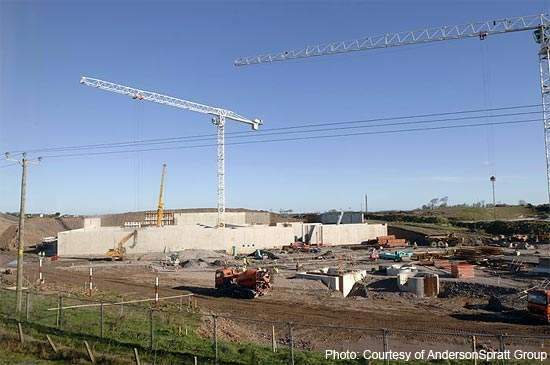 The pumping stations at Donaghadee and Millisle and Briggs Rock were completed in 2007 . The project sponsor was the Water Service Northern Ireland (NI Water), with Glen Water – a Thames Water/Laing O’Rourke JVC – as main contractor. The Glen Water consortium partners are Glen Water, BSG Civil Engineering, Dawson WAM, Williams Industrial Services and Hyder Consulting. The consortium is also responsible for operating and maintaining the facilities for 25 years. McGrigors were contract advisers to Glen Water with Mott MacDonald as technical advisers to NI Water. The engineering design was by Hyder Consulting and Grontmij was the independent project certifier.